Click the link below to download the full learning brief. 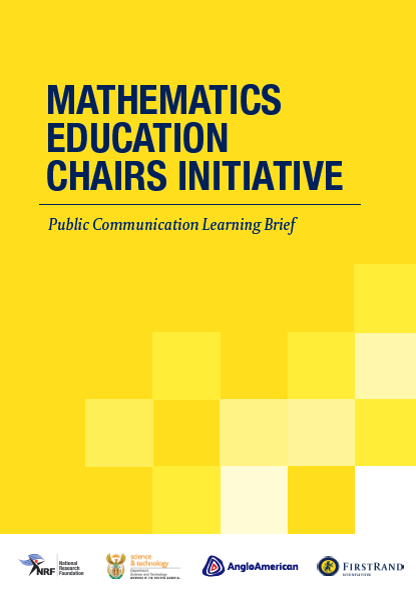 We are delighted to present the Mathematics Education Chairs Initiative (MECI) Learning Brief to you. Into its ninth year of implementation (2010 – 2018) and second five-year cycle of funding, the MECI programme has made great strides in its goal of improving mathematics teaching and learning in South Africa. As you will glean from the booklet, the Research Chairs, in their individual and collective capacity have identified, designed, researched and implemented innovative solutions for improving in-service mathematics education. When we started the programme, we had long-term vision; that vision was to “strengthen mathematics education by fostering collaboration between government, private sector, universities and other civil society organisations. We tapped into the intellectual resources at various universities, the social capital of private sector and civil society to support government tackle the crisis of mathematics education in the country. This is the story of the MECI which has now grown into a strong eco-system involving policymakers, researchers and practitioners in the field of mathematics education. As the FirstRand Foundation (FRF) we are proud to have led the development of this important booklet in collaboration with our key partners in the initiative; National Research Foundation (NRF) and Anglo-American Chairman’s Fund (AACF). As partners we strategically placed emphasis on both research excellence and programme implementation in pilot schools to test efficacy of the Chairs` innovations. Our hope is that this booklet will go a long way towards dissemination of lessons, outputs and outcomes of MECI and serve as an advocacy tool for the models of professional development of mathematics teachers. We also hope that policymakers and practitioners alike will draw from this booklet.